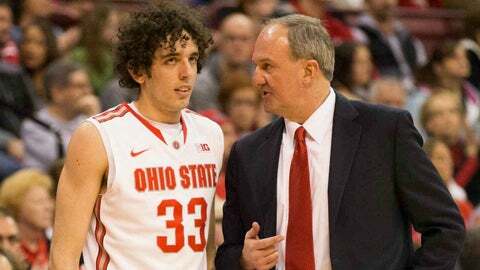 Ohio State Buckeyes head coach Thad Matta talks with guard Amedeo Della Valle (33) on the sideline of the gama against the North Florida Ospreys at the Schottenstein Center. Ohio State won the game 99-64. Bright lights, really big city and a pretty big game. No. 2 Ohio State (11-0) gets all three Saturday night when it plays Notre Dame in the marquee game of the Gotham Classic at Madison Square Garden. It’s the marquee, pre-determined highlight game; not the final. The Gotham Classic is a multiple-game event, not a tournament, and this Buckeyes-Irish matchup was long ago scheduled for national television. It’s a good thing, too, because Notre Dame lost to North Dakota State as part of the event last week. The Gotham Classic has played out thus far in positively un-Gotham like locales such as South Bend, Ind., Fargo, N.D., and Smithfield, R.I., in addition to Columbus, with Ohio State and Notre Dame each playing Bryant, North Dakota State and Delaware. Now, 11-0 Ohio State hopes to keep its momentum going in the main event against an experienced Notre Dame team in what Ohio State coach Thad Matta is very much treating as a business trip. "We fly out Friday night, and by the time we get in, we have meetings and film," Matta said. "We will shoot on Saturday morning. Then we pack up our stuff and head to play the game. We don’t have time for (distractions) and a bunch of other stuff." Our defense is going to drive us. Ohio State has handled success well against a pretty light schedule. Just two games away from moving into Big Ten play, facing an opponent with veteran players and big-stage experience should serve the Buckeyes well. Notre Dame is 8-3. Like the Buckeyes, the Irish have played one true road game. The Irish won their only neutral site game last Saturday, 79-72 over Indiana in Indianapolis. Senior wing Jerian Grant leads the Irish at 19.1 points per game. Garrick Sherman, a 6’11 senior transfer from Michigan State and native of Kenton, Ohio, is Notre Dame’s second leading scorer at 14.3 points per game and the leading rebounder at 7.5 per game. No current Ohio State players have played in Madison Square Garden, though new ACC member Notre Dame played there in the Big East tournament in previous seasons. That comfort level may or may not be a significant factor, but "I hope it’s huge," Notre Dame coach Mike Brey said. "We will really cherish it." Brey said his team "was backed into a corner" last week vs. Indiana after losing to North Dakota State and responded well. Notre Dame hasn’t played since due to final exams, and Brey will be looking for his team to get back to top speed quickly against an Ohio State he said has been operating with "machine-like" efficiency. Wednesday night’s 76-64 Ohio State win over Delaware marked the first time in five games Ohio State didn’t shoot better than 50 percent from the field. LaQuinton Ross had 19 points and three blocks, and Matta said his team got "really, really good minutes" from its bench in that game. Amededo Della Valle joined four starters in double figures; Matta has been playing nine players consistently this season. Della Valle could play an important role Saturday night as Matta expects to see zone defense from Notre Dame. With Ross locked in and Lenzelle Smith having his best season, the Buckeyes are much more likely to be able to shoot Notre Dame out of the zone than they were last season. Sherman should provide a test for Ohio State post man Amir Williams, who had 12 points and 11 rebounds against Delaware. It’s a game both teams have had circled as the non-conference portion of the schedule winds down. "Our defense is going to drive us," Matta said. Whether or not Notre Dame stands as Ohio State’s best opponent yet, the Irish and the atmosphere should provide an opportunity that could help Ohio State down the road. Ending the Buckeyes’ unbeaten streak would certainly be Notre Dame’s biggest win. "I think our guys will be ready to play," Matta said. "Notre Dame is certainly a quality opponent. It’s going be a challenge for us. We’re going to have to play our best basketball."